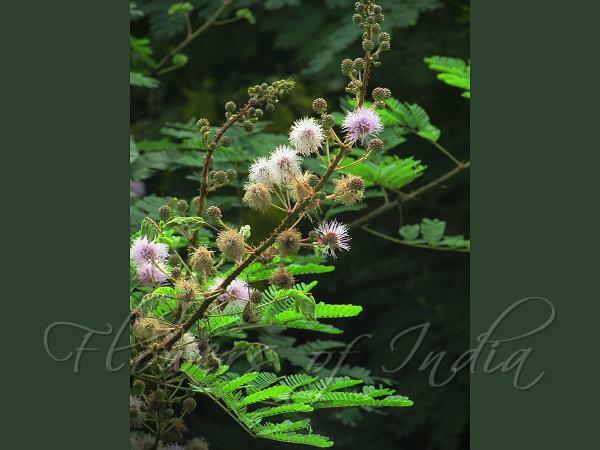 South-Indian Mimosa is a large straggling shrub which is very prickly. It sports long clusters of many pink spherical flower-heads which are 1-1.5 cm across. The flowers fade to white - so, at any time the clusters sport both pink and white flower-heads. Leaves are doubke-compound, 8-15 cm long, with thorny rachis. Leaves have 3-6 pairs of side-stalks, each with 14 pairs of tiny oblong leaflets 4-8 mm. Pods are thin, flat, curved, 8-13 cm long, 1 cm wide, breaking into 4-10 rectangular 1-seeded units, leaving the remains of the pod attached to the shoot. It is considered useful for hedges. 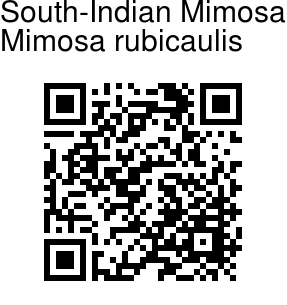 South-Indian Mimosa is found in South-India. Flowering: June-September. Identification credit: Nidhan Singh, Santhan P. Photographed in Coimbatore Dist., Tamil Nadu.